Being 16, I can barely believe my luck when I’m granted entry. It would be some time before I realised that Spiders wasn’t merely accepting of minors’ custom, but wholly reliant upon it. I try to get my bearings. Spiders is dark. I mean really dark. To this day I’ve never been to a club that dark; I’m not sure how much it had to do with creating an ambience and how much to do with the owners’ unwillingness to fork out on electricity. After some deliberation I buy myself a Green Monster – an in-house “cocktail”, served in a pint glass – and relax. The music emanating from the dancefloor is some unremarkable Britpop hit or other. I look at the wall. And then I realise the wall is looking back at me. In fact, the wall is moving. It dawns on me that there are six or seven people leaning against the wall, clad all in black, maintaining a monkish silence, looking distant and more than a little bit tortured. The unremarkable Britpop tune comes to an end, and there’s a brief pause while the DJ fumbles with the controls. Then a new song begins. The song is Sisters of Mercy’s ‘Alice’. Activated as if by remote control, the sextet of black-clad folk who I’ve mistaken for a wall troop off in the direction of the music, still not uttering a single word to each other. I follow them at a short distance. When I reach the dancefloor they’re there…dancing. Well, I say dancing; more accurately they’re stomping, or sluggishly waving their torsos without moving their feet, or holding their heads in their hands as if in a rapture of pain, or pleasure, or both. It’s like some kind of demented exercise video. Other groups of similarly attired characters arrive at the dancefloor at the same time, and a few of them exchange words, dance together, get off with each other. Then ‘Alice’ stops, and every single one of them returns to the corner of the club they came from, to continue their necking or simply resume brooding in silence. These characters, you will have gathered, are the Goths. I’d seen plenty of goths before – they’re an enduring fixture of suburban life – but until this point I’d never witnessed them in their element. It wasn’t pretty, witnessing them in their element, but it was kind of endearing. I’d seen the same folks in daylight, dressed the same way, at bus-stops around town, hoping that their bus arrived before the next torrent of abuse from some lad in a tracksuit. Invariably misfits with low self-esteem, there was undeniable courage in their commitment to the gloomy cause. That was 1999, and this is 2010. Not a great deal has changed in the interim. To most people goth still represents the epitome of uncool and artistic worthlessness, goths still get beaten shitless at bus-stops, Spiders still sells luminous vodka cocktails to children. But it wasn’t always this way. In the years ’79-’87, when goth was still just a moody outgrowth of post-punk and not yet an indiscriminating global sub-culture and consolation for the socially excluded, it yielded some of the most ambitious and affecting music ever-made. I’m not a goth, nor was I meant to be. I wasn’t there in ’79-’87. I didn’t live through it. So what follows is an idealised portrait of goth in its infancy. It’s highly selective and at times insensitive. I’ve ignored goth acts who were popular and important to the scene’s development on the grounds that I simply don’t like their music – so no Fields Of The Nephilim, no Mission, no Danielle Dax, etc. I’ve privileged those records that are sonically compelling: as much as goth was about excess, the shadow of Martin Hannett looms heavy over its best records, with minimalist arrangements and cavernous production the going rate. A few of the releases I’ve highlighted could just as easily have found their way into a 20 best industrial, synth-pop, post-punk or minimal wave. So what, you may ask, do I even mean by “goth”? For the purpose of this list, at least, goth is unfashionable credulousness, sincerity and lack of cynicism. An appeal to higher forces, the dignifying of small emotions with grand imagery. Goth is a return to the poetic; the real post-punk romanticism. But perhaps more than anything…It’s all about the drums. The drums always sound amazing. Forget the idiots in Camden still caning Sisters CDs and dressing for Columbine. Forget the emo and metal kids who’ve inherited goth’s angst but none of its class. The stylish, experimental, theatrical founding spirit of goth is alive and well elsewhere: in the windswept murder ballads of Zola Jesus, the thumping electronic pop of White Car and Frank (Not Frank), in the decaying electronics of Raime and Leyland Kirby, the kohl-eyed darkwave of Cold Cave. Don’t fear the reaper. 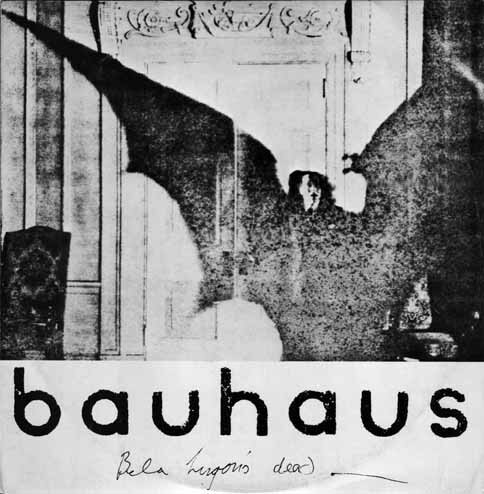 Bauhaus embody the escapist, self-dramatizing spirit of goth. Hailing from none-more-bland Northampton and led by rake-thin and androgynously handsome Peter Murphy, the band’s persona erred on the side of pantomime, but their decision to break away from the spartan realist image of punk and its immediate offspring now seems nothing if not bold. Like their hero Bowie, Bauhaus understood the importance of fantasy, and how that’s bound up in the visual: from sleeve art to clothing, make-up to stage lighting. Back when they were first trying to get signed, they issued a video rather than an audio tape to record companies. via 20 best: Goth records ever made – FACT Magazine: Music News, New Music..